There's nothing more I love than spoiling you, dear reader - and spoiling you, I shall do! Ladies, we all know that a way to a man's heart is through his stomach - so in the spirit of Valentine's Day, I want to spruce up your kitchen with something special from Appliances Online! 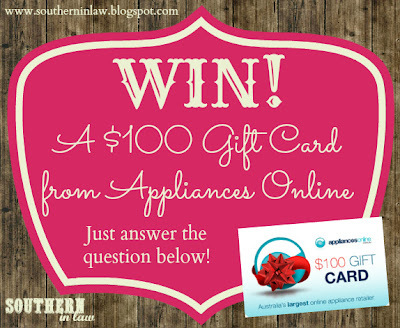 One lucky Southern In-Law reader will receive a $100 Gift Card from Appliances Online to spend on whatever they choose! Just take a look at what you could buy! Head to Appliances Online and pick one item that you would love to have in your kitchen and tell me what you'd make with it first! 1. "Like" Southern In-Law on Facebook. 2. "Like Appliances Online on Facebook - and leave a comment letting them know that Southern In-Law sent you! 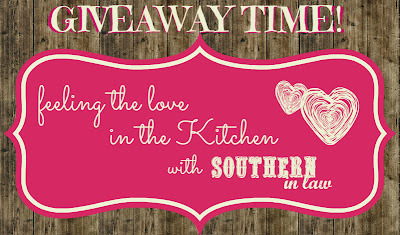 Competition closes Friday 1st March, 2013 at 9am EST. The winner will be notified by email. This competition is only open to Australian Residents. As i don't own any electrical applicances this can blend mixes pulser etc for cakes salsa smoothies ice the blades its usages many other machines. Ohh I would LOVE the Breville Bread Maker! I've wanted one for ages as I love fresh bread but it can be pretty expensive. Would love to be able to make my own easily. Would be great for my daughter's kindy lunches and also it would make getting up at the crack of dawn with bubba so much easier if you woke to the smell if freshly baked bread. Yum! Mmmm, the G3Ferrari Pizza Maker. I'd use it to make my semi-famous Mexican Taco Pizza. Yum. Cooking can get mundane, is it any wonder?! I'd love a slow cooker please!! I follow you on instagram but couldn't figure out how to download the pic, sorry!! I really want a kitchenaid mixer, i would love to make a french cheesecake or pavalova for my Gran! follow on Instagram and reposted competition post. I'd love to get Breville Bread Maker BBM800 in my kitchen, to make fresh loaf of bread every week. The slow cooker please. Life being so hectic would be like coming home to a cooked meal every night!!! already a"Like" Southern In-Law on Facebook. Liked Appliances Online on Facebook - and left a comment letting them know that Southern In-Law sent me. I'd love a red Breville Food Mixer and I'd whip up a Lemon Meringue Pie. Yes, I've never made one before, but with an actual mixer (instead of doing everything by hand), I'd have no excuse! A Champion Juicer 2000 as it can do so much. As it's mango season I'd make frozen mango delight! I already Like Appliances Online on FB. I've Liked Southern In-Law on Facebook. I would loooove a Billi instant filtered hot water tap. It would be perfect for making my morning cuppa - no more waiting for the kettle to boil! I liked you and Appliances Online on Facebook. a morphy richards kettle, i love my cups of tea, cant live with out them. LIKE THE RANGE OF TV'S - NEED ONE FOR KITCHEN. THANKYOU. And fill our bellies with contented fare. Is sure to keep us all transfixed. To go along with sweet cappuccino 'phily' pancakes. I have LIKED Appliances Online on Facebook and left a message that you sent me. I love love LOVE the KitchenAid Artisan KSM150 Stand Mixer. I would use it make all things sweet and evil! I've recently been inspired to give bread making a go, so if I was lucky enough to win, I'd choose the Sunbeam Bread Maker! Liked Southern In Law on FB! Liked Appliances Online on FB! I would love a Kenwood Food Mixer (my mum has one) because it would help making my own bread so much easier. A red Delonghi coffee machine - and I would make a wonderful cup of coffee! The Dishlex Dishwasher DX103WK, with it I'd 'make' my Mum's life a lot easier. I would like the Sunbeam Food Mixer and I would use it to cook up a feast - sausage rolls, quiche, and then something decedent for dessert. Panasonic Convection Microwave NNCF781S. I'd make roast chicken masala pieces with roasted carrots and potatoes. I like Southern In Law on facebook. I like Appliances Online Australia on facebook and left a message on their facebook wall. Hmmm it's a tough choice! I'd probably go with the Breville Food Mixer. I don't even know what I'd make first - cheddar jalapeno biscuits, soft pretzels, margarita cupcakes, chocolate chip banana bread...the list is endless. First thing I would make would be some healthy bikkies and cakes for their school lunches- and yes- I would keep these ones out of their reach! I would love the Milkshake Makers as can you imagine the out of world milkshakes it could make for the little grandkids. :-) I liked/loved Appliances Online. My kettle has just carked it so I would make a great coffee with a new Morphy Richards one. I'm DREAMING of owning a Philips Saeco Intelia Coffee Machine... first output would be a rich, strong latte! Liked Southern In Law on FB. Liked Appliances Online on FB too! I'd love a Tefal Food Processor so I could make amazing healthy desserts for Summer. In particular, my favourite two ingredient creamy banana ice cream! All you need to do is cut up some ripe bananas and freeze them for a few hours. Pop them in a blender or a fancy new food processor and whizz them up until they're smooth. Add a dollop of peanut butter or macadamia butter if you're allergic and process until it's all mixed together into a creamy icy sweet mass.